Are “Straight to Test” Pathways Always Best for Patients? Aim: Many centres have adopted a straight to test approach to deliver a fast-track service for suspected lower GI cancer. adjusted coefficient −3.71, 95% C.I. −8.92 to 1.50. The STT group had 0.4 more tests per patient, adjusted 95% C.I. potential cost and time benefits, it may come at the sacrifice of exposing patients to additional investigations. those with colorectal cancer fulfil these criteria [5,6]. and represents a significant workload to most hospitals. fective method of delivering this diagnostic service . being dependent on referral information . 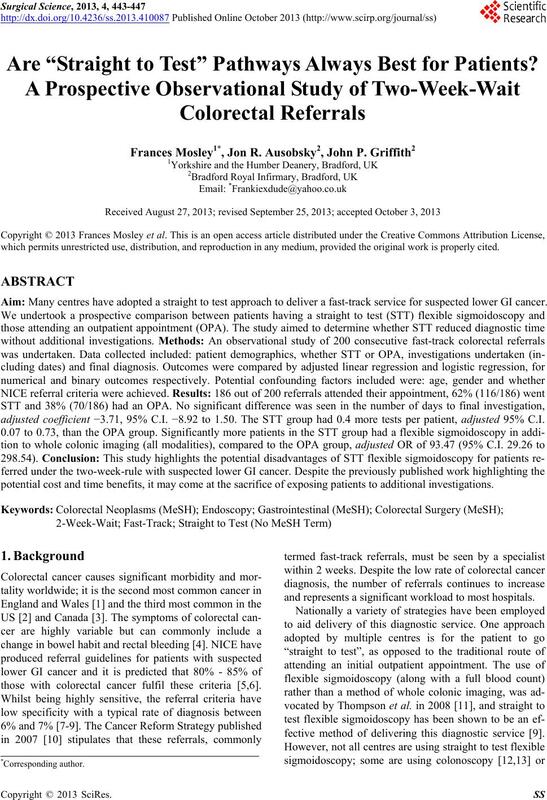 acceptability of the diagnostic pathway to patients . increasing the number of investigations required. Infirmary. All referrals were referred from their G. P.
from review of the final clinic letter. frailty (based on their age) or symptoms of anaemia. criteria were fulfilled (based on referral letter). tors. The significance level for all test was set; p < 0.05. 37.6% (70/186) were seen in an outpatient appointment. was missing and therefore not included in this analysis. 95% C. I. 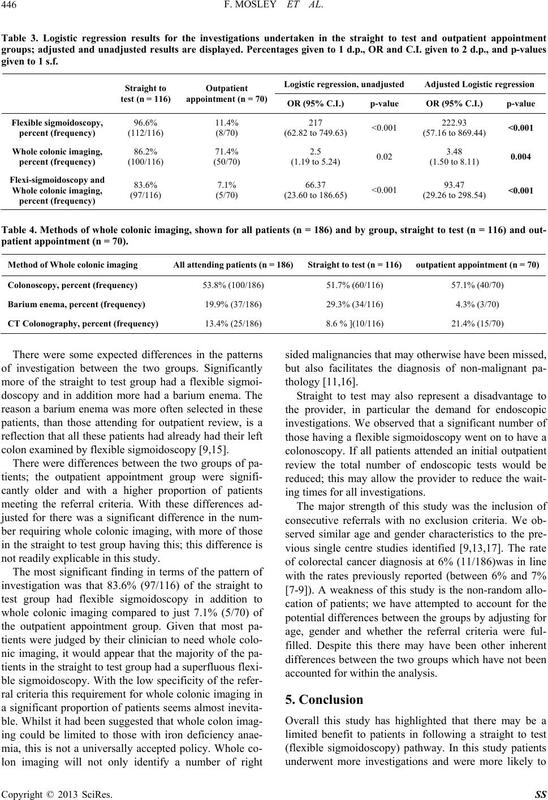 0.07 to 0.73), p = 0.02; see Table 2.
and outpatient appointment (n = 70). 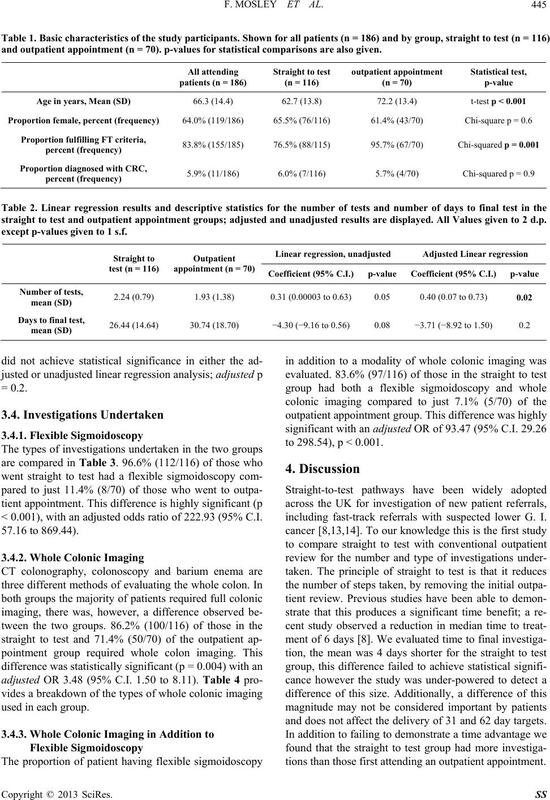 p-values for statistical comparisons are also given. straight to test and outpatient appointment groups; adjusted and unadj usted results are displayed. All Values given to 2 d.p. except p-values given to 1 s.f. < 0.001), with an adjusted odds ratio of 222.93 (95% C.I. to 298.54), p < 0.001.
including fast-track referrals with suspected lower G. I.
and does not affect the delivery of 31 and 62 day targets. tions than those first attending an outpatient appointment. patient appointment (n = 70). colon examined by flexible sigmoidoscopy [9,15]. not readily explicable in this study. ing times for all investigations. accounted for within the analysis. Practice, Vol. 64, No. 12, 2010, pp. 1671-1674. 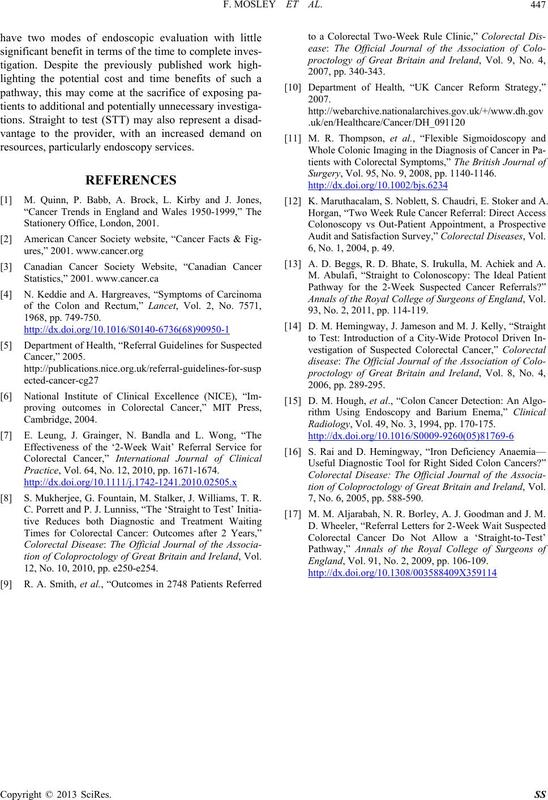 S. Mukherjee, G. Fountain, M. Stalker, J. Williams, T. R.
tion of Coloproctology of Great Britain and Ireland, Vol. 12, No. 10, 2010, pp. e250-e254. Surgery, Vol. 95, No. 9, 2008, pp. 1140-1146. K. Maruthacalam, S. Noblett, S. Chaudri, E. Stoker and A. 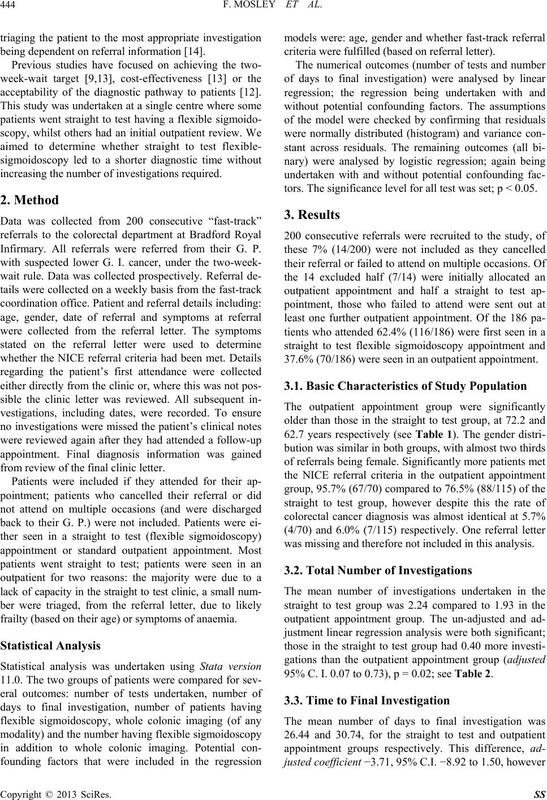 Audit and Satisfaction Survey,” Colorectal Diseases, Vol. 6, No. 1, 2004, p. 49. A. D. Beggs, R. D. Bhate, S. Irukulla, M. Achiek and A.
Annals of the Royal College of Surgeons of England, Vol. 93, No. 2, 2011, pp. 114-119. Radiology, Vol. 49, No. 3, 1994, pp. 170-175. 7, No. 6, 2005, pp. 588-590. M. M. Aljarabah, N. R. Borley, A. J. Goodman and J. M.
England, Vol. 91, No. 2, 2009, pp. 106-109.